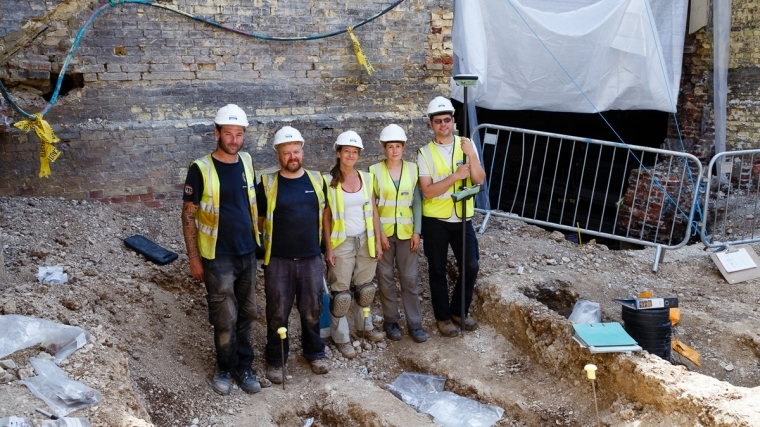 Following the exciting discovery of a 200-year-old Quaker Burial site during the Corn Exchange redevelopment, we spoke to some of the team from Archaeology South East who are carrying out the excavations, Darryl Palmer (Assistant Director, Head of Fieldwork & Survey), Garrett Sheehan, and Dr Paola Ponce. Can you tell us about what you found here and how the discoveries were made? Darryl Palmer: What we found is the remains of the Quaker burial ground we knew was here from map evidence, we know that the use of the site finished around 1805. The reason we are here is because of the major regeneration works here that are going on at Brighton Dome. 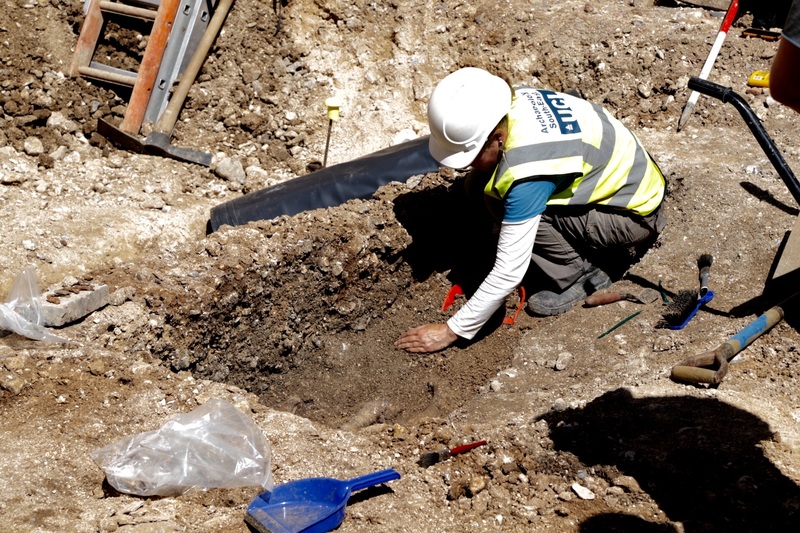 Part of that process is a planning process that brings archaeologists onto site to keep an eye on what’s going on, on a site as important as this. Most of what we have found so far has been earlier walls which relates to the early use of the buildings, they relate to the structure itself. But this is obviously an earlier finding that predates Brighton Dome slightly. We’ve got an archaeologist here watching the general ground reduction as the ground is levelled for the basement, doing that we’ve uncovered these burials, and at that point we’ve stopped and taken a step back and given the archaeologists time and the chance to exhume, and remove and record the burials. What do you know about the history of the site at this stage, do you know how old the skeletons are? Garrett Sheehan: We believe the skeletons are within 300 years old. Maps from about 1801, which showed this area marked off as Quakers Croft, that was an indication that there would be Quaker burials here. The main phase of works here at Brighton Dome was about 1811/1812 so the burials were cleared before that. In this area, outside the old riding school we have a number of old burials which weren’t moved to the new Quaker premises but we suspect we’re probably looking at maybe the later part of the 18th century. We think the burial ground here was probably in use for about 50 years or so. Does this find tell us anything new? Paola Ponce: Well for instance in terms of pathologies which Is my field of expertise, I would say that, so far, they show what we would expect from a 18th century population, such as poor dentition. I wasn’t able to see the joints of the skeletons to be able to tell whether they have any evidence of joint disease but hopefully once they are washed in the lab then we will be able to analyse them better but what I would say is that the finds were within what we would expect to find within this population. Can you tell us a little more about the process of excavating the site, how many there are involved in the team and how the process works? DP: Archaeology South East is based down in Portslade and we’re part of the University College London so we deal with the contracting archaeology and have a team of about 150 all in, but in an area like this we’ve brought in a team of 5 at the moment, we obviously have in mind we have to clear the burials respectfully but at the same time get things ready for the next stage of the development that needs to happen on site. How long does the exhumation process takes? DP: We aim to lift normally between one or two burials a day with professional archaeologists, but the ground here is particularly gravelly so process is slower that it would normally be, so we expect to lift a burial a day with professionals, therefore we will be done in 4 to 5 days depending on how many more we find as the site is cleaned up and exposed. 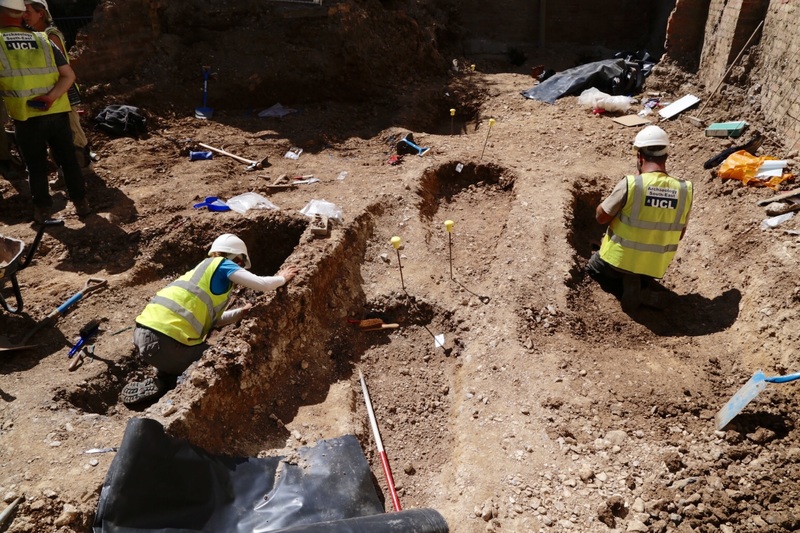 What happens to the excavated remains? DP: The first thing that happens here is they are carefully lifted here and bagged up separately, they’ll go back to our office where they are cleaned and looked at in detail by our osteological team and after that has happened, that process analysis, then there are decisions to be made still about whether they are reburied or cremated and reburied or whether they are stored for longer term curation and study. Is it unusual to have this number of burials in one place? DP: No if anything this is actually quite a small population for a cemetery and we think that is probably because it’s quite a small period of time of use and is quite specifically for Quakers rather than a wider Christian population. 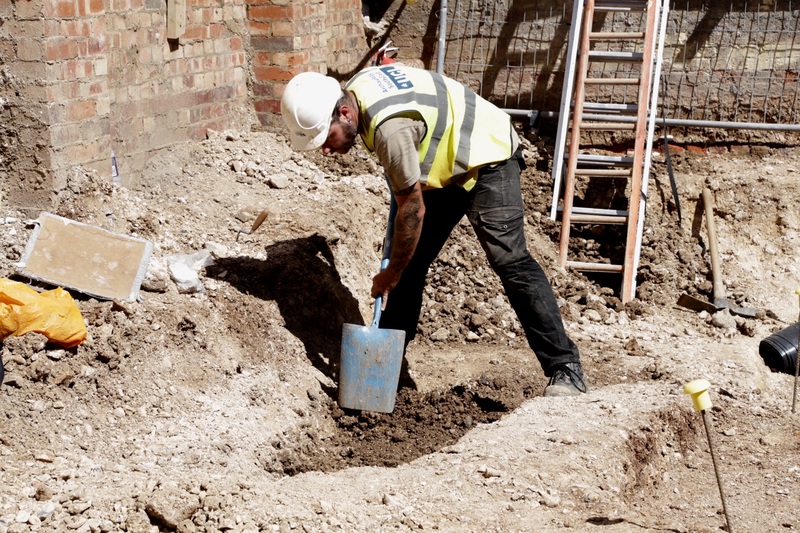 How common is it for you to bring in a team to excavate at building sites in Brighton? DP: Our company works all over the southeast as well as Brighton. What we’re doing is connecting with planning permission so developers often contact us to deal with archaeological planning conditions, and these sorts of finds are what makes the job interesting day to day; sometimes you find nothing and sometimes you stumble across the remains of a cemetery.